the 2.35 nevegals on my AM bike are worn out and ready for replacement. Lately been riding these trails: - ridge 3, pappy's, ridge 2, maarat nursery dh trail, patiis (only occasionally, as its too much really for the bike and this rider, but shotgun sure makes it accessible!)). I like to ride to the top when I can, so tires have to be light enough to climb with. I also still take the bike on epic rides, so tires need to roll decently as well (i thought nevegals rolled a bit slow). I also stay away when its muddy, so I don't need much mud clearance. 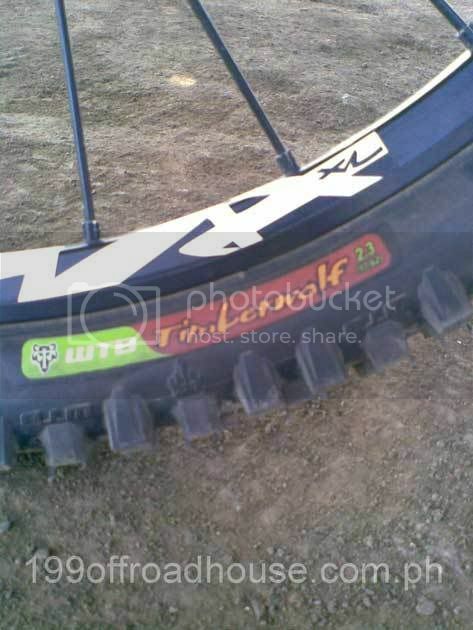 Would appreciate the collective wisdom of the longtime DH/AM riders to inform my next tire buy. 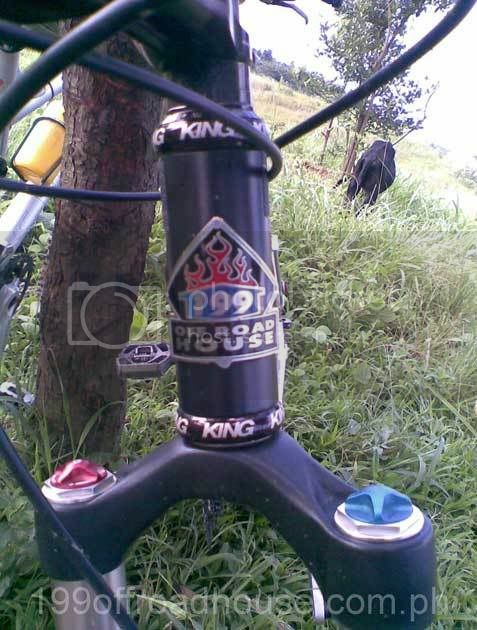 tioga blue dragon 2.3 and kenda karma 2.3. knobs of these tires are widely spaced ang chunky, squared. but nothing beats nevegals talaga. hi! i've recently got myself an all mountain rig. 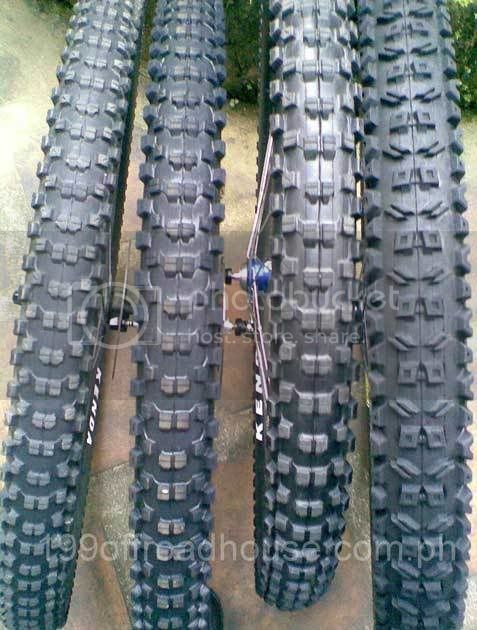 i'm looking for light fat tires to make me go faster on flats and uphills. at the moment, im using specialized team control at 2.2 size for the rear. weighs in at 735 grams. my front is a 2.3 weifwolf. weighs in at 835 grams. any ideas where i can get ligth but fat tires? please post weight, prices, and where to buy. even adding reviews would be great. thanks in advance. Hi! Looks like we're on the same wavelength! I've got a five inch trailbike that I'm trying to turn into an All Mountain rig. It's just a personal trip because all the trails I ride can actually be ridden on a hardtail ;D so please bear with me, it's not like I'm some gnarly rider Also, I don't own a lot of the gear I'm testing, I'm just lucky to have friends I can swap stuff with to test. As my AM trip got more intense, the tires got fatter! I'll just share something I learned - the width of the rim makes a big difference in plumping up your tires. Build weight was 28+lbs. Tires were Conti Vert Pro 2.3s on 18mm rims (Xmax SLs). I haven't weighed the tires yet, but claimed weight is around 600 grams. Rolling resistance of the Conti Vert Pros was really low, far lower than the 2.1 Nevegals I normally use (I run Stick-E front and DTC rear) and grip was excellent. Very good tires, but undersized for their claimed width, they're more of a 2.1 than a 2.3, but I like them. 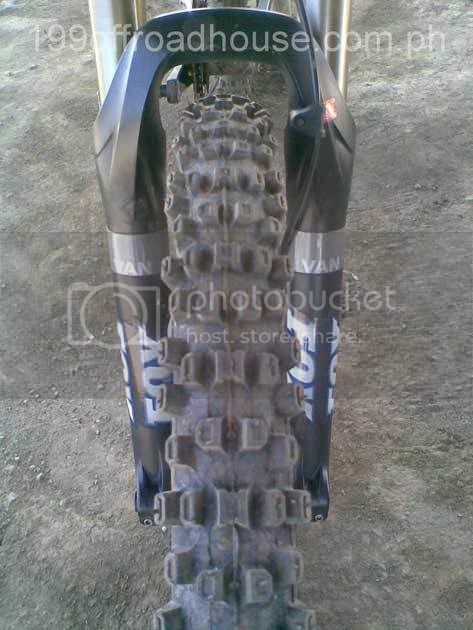 I was also able to test Maxxis High Roller 2.3s. Wire bead, dual ply sidewall, super tacky tread. They weigh more than a kilo each on the Powerbike gram counter. Rims used are Da Bomb 36mm rims, on Da Bomb Headspin hubs. Bike weight went from 28+lbs to 34 lbs. Well it still climbs, but a lot slower than before. Traction from the tires was incredible. A big factor here was the width of the rims - 28mm seems to be the AM standard (DT5.1s, Mavic 321s 26mm) but I was running very wide 36mms. I remember High Rollers being round but on these rims they became square! Here's a pic of build two at the rest stop at the top of Reverse AFP. My verdict - the weight is a small price to pay for the incredible traction for short technical trails, but a little too much for a whole day epic trail like Veterans to Maykaingalan. I would like to try the single ply folding version though. 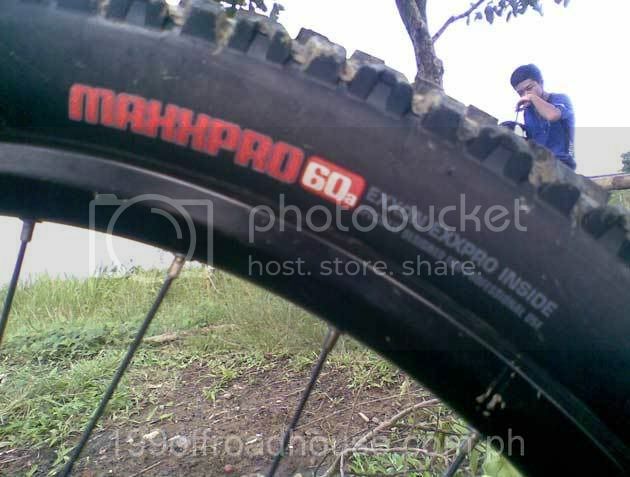 I was able to test the Maxxis Advantage 2.4 tires on the trail today thanks to the kindness of Boyet Camba, who lent them to me to indulge my All Mountain trip. The Maxxis Advantage 2.4 tires are huge - as wide as but much taller and with bigger knobs than the previous 2.3 High Rollers I was using. 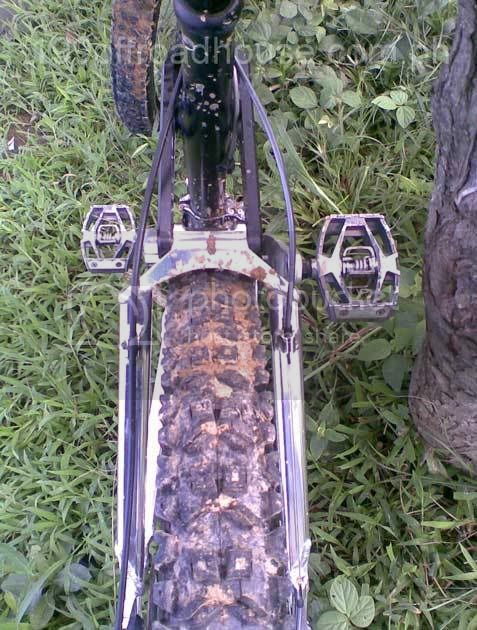 They completely filled up the arch of the rear triangle of my bike leaving paper thin mud clearance, but they gave tremendous traction and stability. On the dial scale at Powerbikes they came in at some 800 grams, compared to more than a kilo for the High Rollers. The Advantages are high volume, low pressure balloon-like tires with aggressive tread and chunky knobs but with very low rolling resistance. Going down the Masukong downhill, I had great grip on the rocks. Climbing the Nabutas fireroad was ok, rolling resistance was low. Grip on the wet and muddy Mahogany trail was excellent, except that my bike's rear arch and fork arch kept packing up with mud! 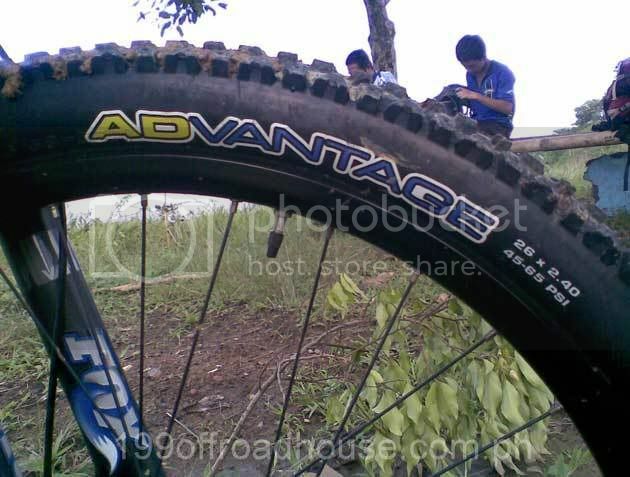 My verdict - Maxxis Advantage 2.4 tires are very good I'll post up pics of the tires on the bike when I have the time. I'll try to borrow a set of Nobby Nics from Manolet and see how they work next! Hi guys, here are some pics of build 3, with the bike on Maxxis Advantage 2.4s. Rims are still Da Bomb 36mm rims on Da Bomb Headspin hubs. 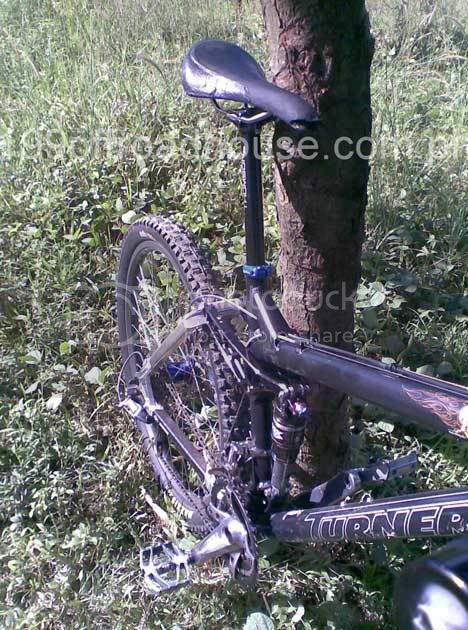 Here's a pic of the bike sharing a tree with the Epic of Bud Chua (of www.padyakbud.com). This at the rest stop of Rev AFP. With the large tires and wide rims, it looks like a Pugsley on steroids. The 2.4 Advantages completely fill up the rear arch of the bike. The tires are not only wide, they are tall, with very prominent knobs. Putting on the rear wheel and tire is a two-man job needing four hands. This is because the rubber of the tire contacts the triangle making it difficult to slide the hub up into the drop-outs. With the weight of the massive wheelset and tires, it gets tiring to hold everything up and finesse it into place, while holding back the rear der and fiddling with the skewer tension and cam at the same time. When viewed from the front, the bike looks almost comical with the wide rubber. The Advantages actually look like motocross tires. The business end of the bike. The wide rim makes the tire lose its roundish shape. The tires look like a square block of rubber with chunky knobs. True to its claimed size, the Advantages are a healthy 2.4. I run them at pressures far lower than recommended. My interest in the latest tires has been spurred by the latest developments in rubber tech, such as Maxxis's Exxon collaboration, claiming a better dispersion of carbon compounds in the rubber. Other examples are Conti's Black Chilli rubber recipe or the triple or double compounds of Schwalbe or Kenda. Just like previous, the Maxxis Advantages exhibit all the claimed benefits of the new generation of tires available today. They are large, light for their size, and very grippy in the wet and on the dry, with manageable rolling resistance on cement. I've sourced a set of Panaracer Rampage 2.3s which I'll be testing soon as a next experiment. Hope this helps. 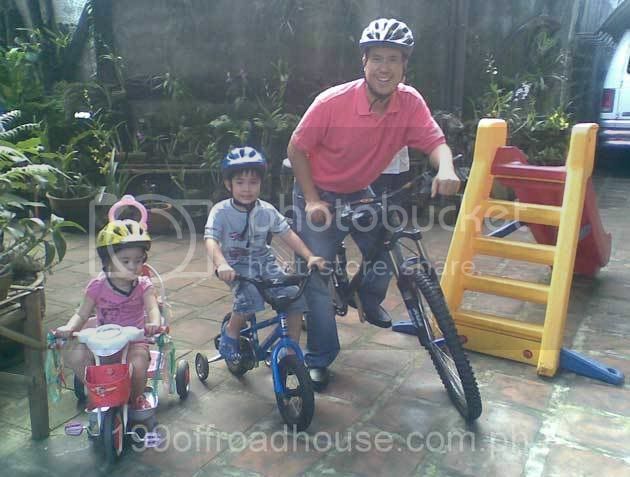 Thanks to Goyo Larrazabal of Bike Town, we were able to cobble together build number 4! We slapped on a set of Nevegal 2.35s, Stick-E rubber front and rear, folding bead, with a claimed weight of some 800 grams. Here's a pic of build 4. Going to the new wheelset was a big change. Build weight of the bike went from 34 lbs with the Da Bomb wheelset and wirebead High Rollers, to 30 lbs with the new wheelset and the folding Nevs. The gnarly slippy slidey area filled with moss covered rocks and wild vegetation are no match for our expert riders. The excellent traction of the Stick-E Nevegals allow me to take the sketchier line. Hehehe ;D Hope to have a more comprehensive review for you after tomorrows trail. Also, no more further testing on the Panaracer Rampage 2.3s, I sold them after two rides. On the first ride, the front tire washed out on a simple mud section of Reverse Afp and I almost hit a barbed wire fence. 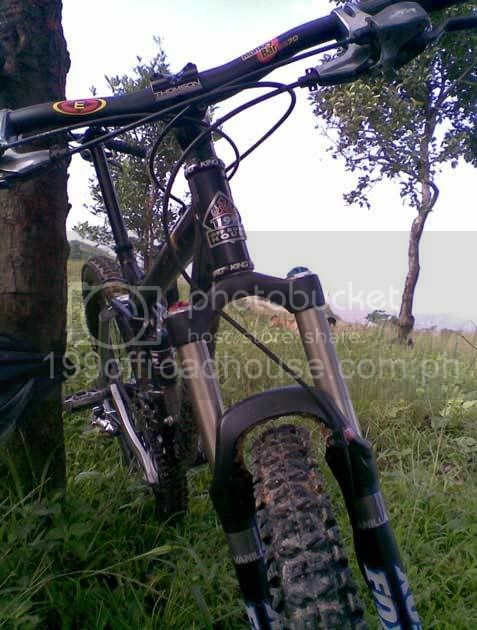 On the second ride, I almost broke my head down the Masukong downhill at Licao when the tires had absolutely no grip on the wet rock slab sections. After a number of trail rides, I can say that the folding Nevegal 2.35s in Stick-E rubber are very good tires. Mounted on a 28mm rim, they are nice and round, giving predictable cornering - unlike my old Michelin Hot S and Nokian Gazzalodis which were square. I could be imagining things but I felt those square profile tires gave great straight-line stability but didn't seem to want to carve turns. Though heavier than a pure XC tire, they are lighter than yesterday's wire bead monsters. They give excellent grip, and the rolling resistance is actually a confidence-inspiring feeling of being "velcroed" to the trail. 1. not to use small XC tubes in large tires - pinch flats result. 2. that Schraeder Nokian downhill tubes are very fragile around the valve area - two brand new tubes gave out on me just while being mounted for the first time. I switched to Toxic 2.3-3.0 Shraeder tubes and have had no problem since. A friend and I were avoiding the mud by running at the edge of the slope, when his bald tires let go. Lucky I was there on my grippy 2.35s to help him out! I was able to get a set of great tires from Paulina's at Cartimar! 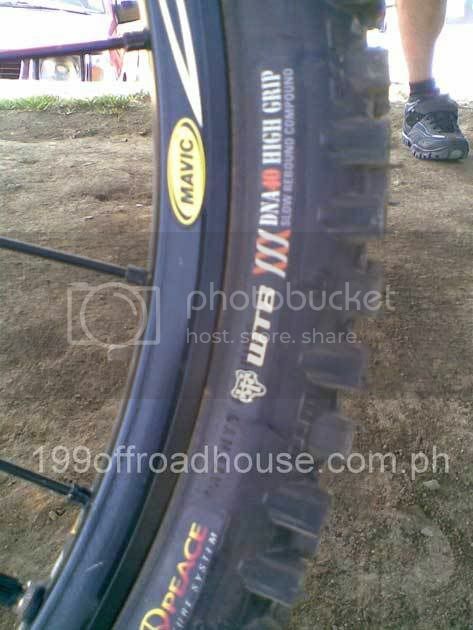 Imagine a set of genuine freeride tires with all the trimmings - proven super-agressive tread, soft sticky race compound for max traction, front and rear specific tread pattern, super strong carcass but folding bead, 2.3 width but with a claimed weight of only 800+ grams, and last but not least, at only P550 per piece! Without further ado..... let me introduce the Maxxis Minion DHF and DHR freeride tires in Super Tacky compound and folding bead! The Maxxis Minion is a proven downhill tire, loved by downhillers for its aggressive grip and sticky soft compound. In fact, the DHR (rear pattern) grips so hard, which is why riders who want to drift their rears around switchbacks choose to run HiRollers in the rear instead, paired with a DHF front tire. 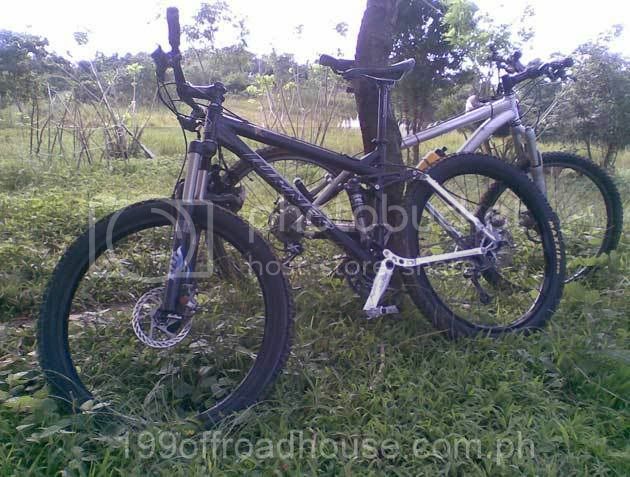 Now, ithe freeride version is available on Philippine shores, meaning with a folding bead and sub-kilo weight, at low prices to boot! Here they are on the bike, on the Rev AFP rest stop. 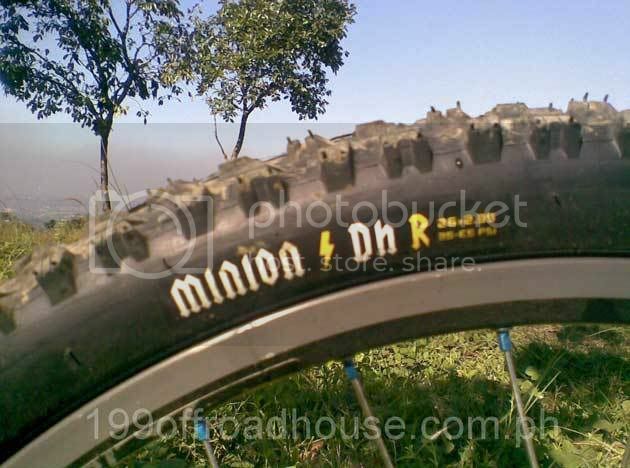 Here's a some more pics of the Maxxis Minion DHF and DHR. The freeride version of a classic downhill rear tire - whose pattern has been maximized for braking and bite! 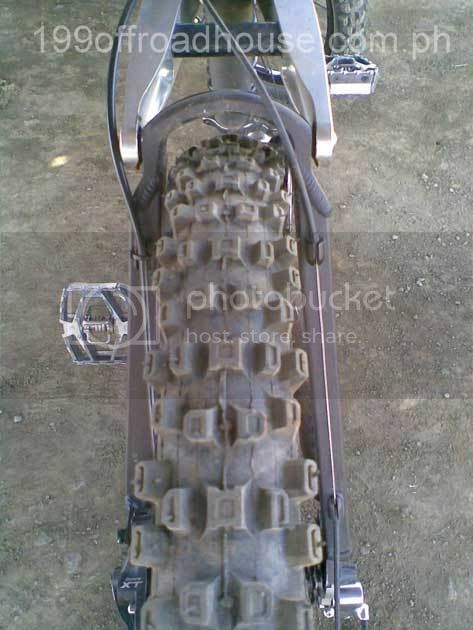 Here's a look at the aggresive rear knobs - real moto! Friends behind me on the trail at first didn't notice the new rubber, till they were surprised at how the rear tire "raped" the trail, leaving deep tire tracks in the moist loam of Maarat! In the short time I used them, not once did they lose traction or spin out. I felt supremely confident using them on the muddy trail. A profile of the DHF front tire - nice and round on 28mm Mavic 721 rims. The large front lugs are designed for maximum hold and cornering grip. The knobs are tall and aggresive, with large spaces in between that spit out mud and loose earth. Use what adjective you want - clawing, ripping, shredding - these tires dig into the trail. Initial impressions of these tires are very, very good. 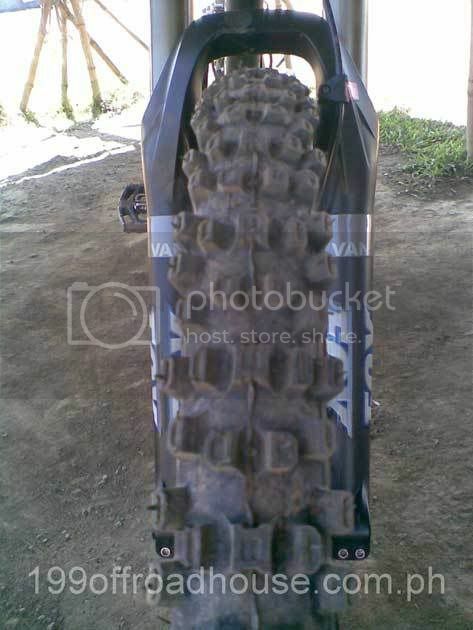 I find them to be more aggresive, more tough, more trail ready than other hi-volume tires in their class. They are a little undersize for their claimed 2.3, but they round off nicely on a 28mm rim, and they give up nothing as far as grip and hold are concerned. In fact their being a little bit smaller than a Nevegal 2.3 makes them even more desireable for ripping up the muddy trails during the rainy season. Fireroad climbs on them have been fantastic. I'll test them on the sketchy singletrack of Karahome and Kokey next week and see how they hold up against mossy rock slabs, slopes and sidehills, wet roots and grass. Browsing through Paulina's I encountered these tires - the cool green logo caught my eye then >kapow< - the huge, huge knobs freaked me out! P500 pesos for a 2.35 size folding tire seemed mighty reasonable so I took home a pair and mounted them up. 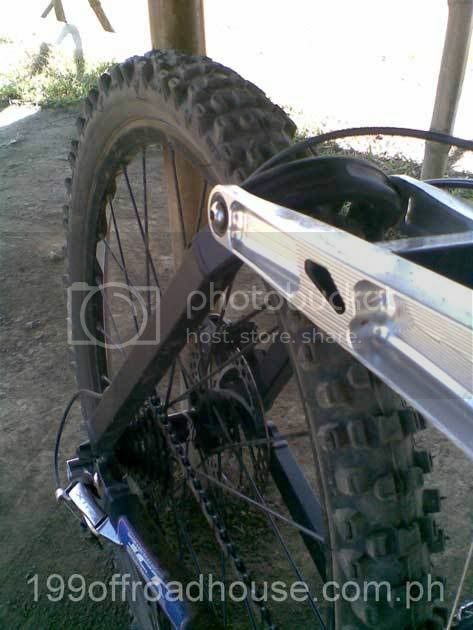 While foldable, the casing seemed quite thick, but was supple and proved easy to mount on my narrow Crossmax XL rims. Popping the folding bead off the rim center and onto the rim hooks was not a problem, a little massaging of the tire was all it took. The markings on the sidewalls only served to make me want to test them more. WTB's version of slow rebound, sticky rubber. Should be yummy on the trail! Mounted up, the tires look real tough. The casing is a true 2.3 width, accentuated by huge (really huge!) knobs. The tread pattern is non-directional, non-ramped, lacks a center line of blocks for good rolling, and seems to be designed for one thing only - to grip the trail. Here's what they look like mounted up. I took the tires up PFA and into the Nursery and it was a bit of a sufferfest - these are the among the slowest rolling tires I've ever used. Manageable in dry conditions but I can't imagine how heavy they would be in the mud. 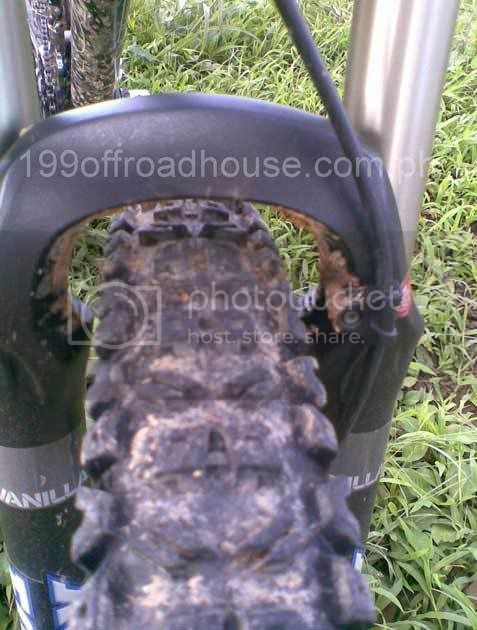 Even using a lightweight Crossmax XL rimset, a 22 tooth granny and a light 34 tooth cassette, the tires worked me over. I begged off from doing the Manggahan and Roxas trails even though the set-up should have been fun on the steeps - I was worried about my heart and my knees surviving the spin up the singletrack. On the plus side, traction was out of this world. I ran the tires a little soft to allow the knobs to do their job, and the tires were phenomenal - super sticky, super stable, and super cushy. I would have no problems taking these tires down any downhill trail. In your face - knobs knobs knobs + sticky rubber = good freeride tires but too much for all mountain. 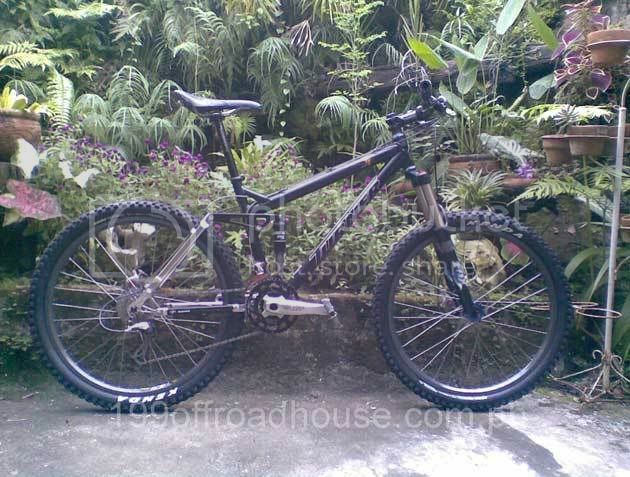 WTB Weirwolf 2.3 folding - P500 each at Paulina's - very, very good tire, kumakalmot talaga sa trail, kinabit ko yung rear sa SS ko na nakabaliktad, super traction on any surface. ayos yung price ng wtb tiberwolf ah. mapuntahan nga si paulina's. Thanks mountguitars for your suggestion - and yes, nevegals are great. really just the rolling resistance I'm unhappy with, especially after the nobby nics on my xc bike. Too bad the rough stuff I ride on the AM would shred their thin casings. Darth Paul, thanks for sharing all that testing work! Promising for my needs seem to be the weirwolf, advantage, and minions. how would you rate them vs. the nevegals in terms of rolling resistance and grip on hardpack and rock? You da tire guru! Ang lupit ng rides mo kuyang, napupunit mo sidewalls ng gulong mo. Your needs go beyond my experience. From what I've tried, much better yata for your application either 2.3 Nevegal Stick-E, 2.3 Weirwolf folding, or 2.3 Maxxis Minnion folding... For me 'di bagay sa 'yo yung Advantage. 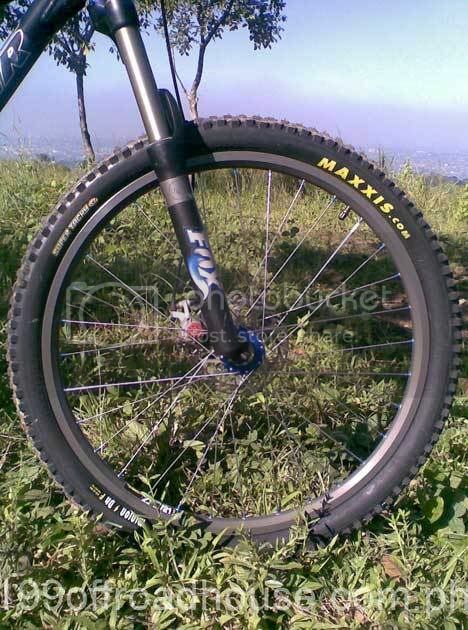 It is more of an XC tire, manipis ang sidewalls (kaya masarap gamitin pag underinflated). Of the three I recommend, the Minion is the narrowest of the three, so if you're concerned about mud clearance, this should help. Grip is DH race worthy, and rolling resistance feels less than the 2.3 Stick-E Nevs. The Weirwolf's tall knobs are squirmy daw (daw - sabi sa reviews) on hardpack which is why they have the lower tread version. 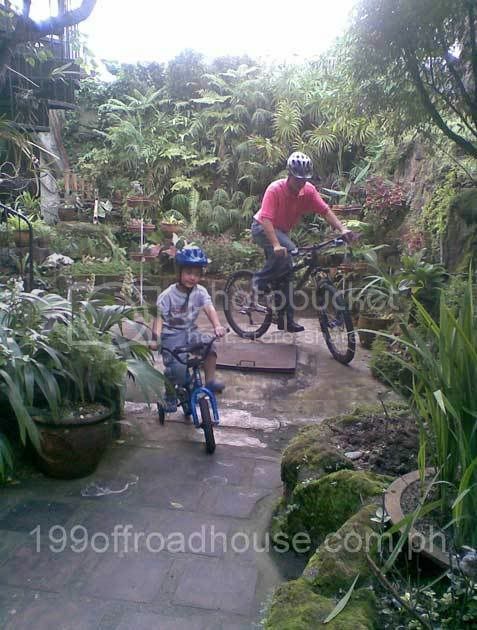 In Pinoy conditions (loamy, moist soil, wet rocks) so far masayang-masaya ako... In wet, muddy conditions the treads really dig into the trail. If you still destroy these tires, suggest ko na the wire-beaded, 2ply versions of those tires mentioned, or you can try IRC Kujo or 2.5 Minions. May tradeoff nga lang sa bigat. Ma-suggest ko din when you scrub your tires after a muddy ride, do not use a brush on the sidewalls as the rubber here is thin. Use a rag to wipe down the sidewalls and save the brush for the knobs. yes, i almost forgot the weirwolf! these are great front tires. if i had nevegals, i'd use them as a front tire as well. rear tires i would usually go for squarish knobbed, neutral tires (meaning walang direction like kenda karmas and tioga blue dragon) so the tire can dig deep and not loose traction in crazy situations. 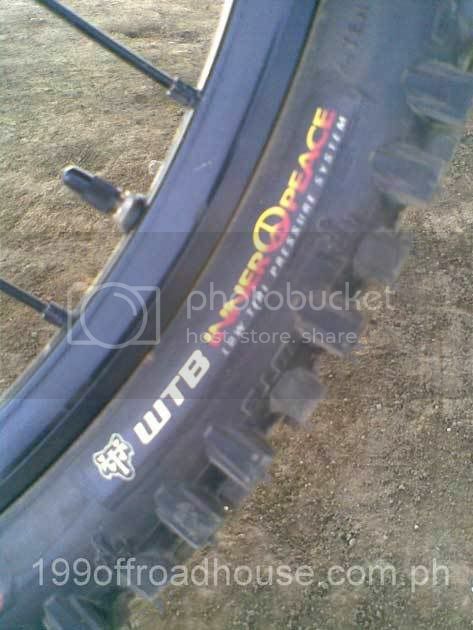 and then there's the tioga factory DH tires which i forgot to mention. squarish, chunky, widely placed knobs, parang blue dragon din except that the blue dragon has taller knobs. so far, wired lahat ng AM tires ko. i actually find it difficult to get 2.3 versions na hindi wired or what we call folding. kaya mabigat ang rig ko. but so far, it does the trick. Thanks for narrowing it down - after researching your suggestions further on mtbr, I think I'm going to give the minions a shot. seem to be faster rolling and grippier than the nevs. maybe a high roller in back to reduce rolling resistance further on those long fireroad climbs up to the top of the runs. Other advantage of this set up - pormang downhiller, kahit hanggang porma lang! Will post back on what I find. mountguitars - just saw your message. you're absolutely right about using different front and rear tires - different demands. after thinking through the kind of riding I do on the AM, its really light dh and fire road climbs to the top (wala masyadong technical climbs dito). so the idea is maximize the fun on the dh, minimize suffering on the climb. or put another way, max traction, min rolling resistance. so we'll see how the envisioned minion f and high roller r work out. hopefully folding, and definitely tubeless, to minimize climbing weight! you should join darth paul and friends. these guys are awesome. more on XC kasi ako and i compete once in a while so medyo conservative ako kasi yung gamit din, medyo lightweight hence, medyo nag iingat din bukod sa medyo sissy ako, hehehe. i do all mountain riding once but nothing crazy or fancy. 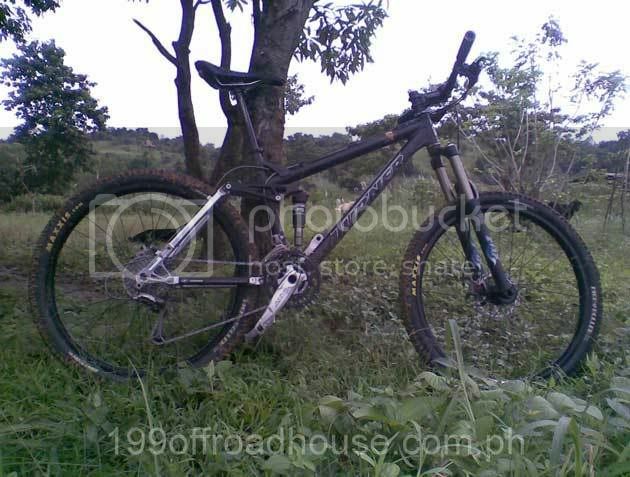 i appreciate how a heavy bike can outclimb XC bikes pag steep, crazy and long ang climbs on techy stuff and goes down flawlessly pag downhill. not the fastest bike around pero it does the trick. maximum satisfaction kumbaga with minimal effort, hehe. kinda gives you an idea what a mountainbike is all about and all the different setups be it DH, XC, trail, yada yada yada. 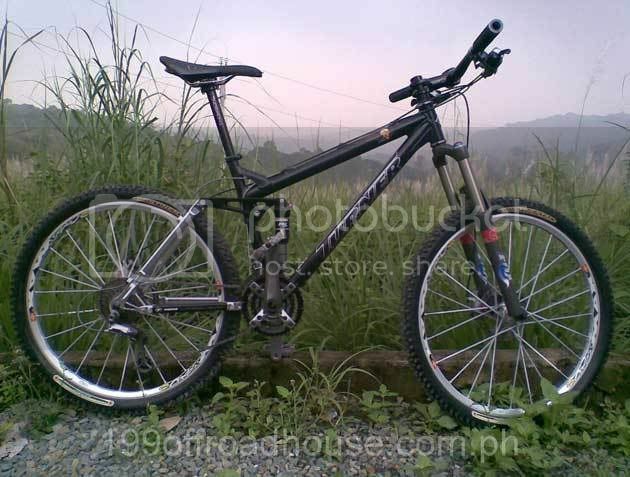 after the racing season, malamang balik AM na ko and that's where the rainy season starts, hehehe. thanks darkman, validates my choice. unfortunately, been having trouble finding my minion/hi roller combo. tried just about everywhere. though couldn't get in touch w dh shops dirt dawg and dh crew, if anyone knows their current numbers. Paulina's was saying na wala pa daw shipment, so I guess I'll live with my worn nevegals for now. 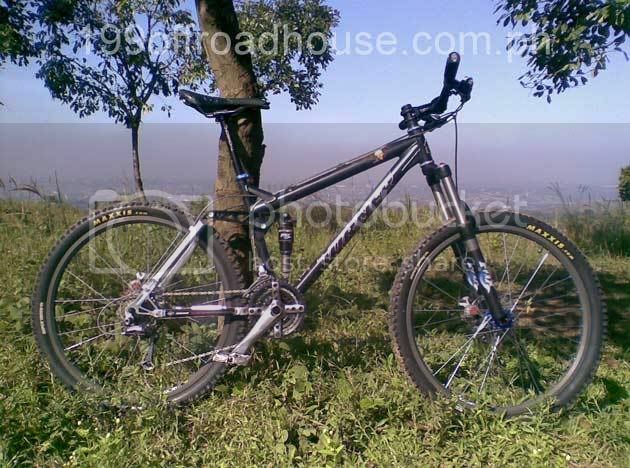 Its almost rainy season anyway, and unlike mountguitars, thats when I hang up the AM bike (I hate mud!) and hit the road. Hard to find Minions..but Maui from PMTB (that's his handle) na tambay ata ng Dirt Dawg dati nung bukas pa sells 2.35 high rollers (non-folding / DH specific) for P1,800 a pair...Note that these are the old versions that have orange linings on the sides... But heck, that's what I have been using and I ain't got no complaints so far... well..except for the fact that they wear out fairly easily..hehehe..
Hi mark, try visiting the bikeshop along Pag-asa in proj.6,qc. meron pa sila stock ng minions and hi rollers. 2 pairs pa yata yun. unahan na lang kayo ng mga AM/DH boys of PMF. 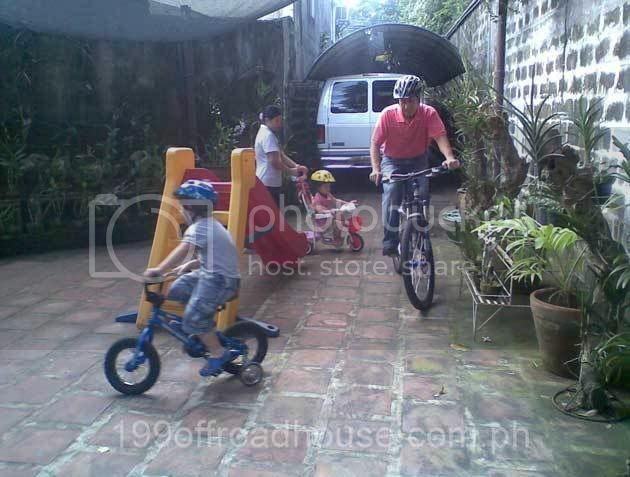 its a small bikeshop on your left if coming from mindanao ave. dalawa yun bikeshop na magkatabi e, yung first bikeshop. dun ko nakita a few days back yung tires na hanap mo. didn't ask for the price though. 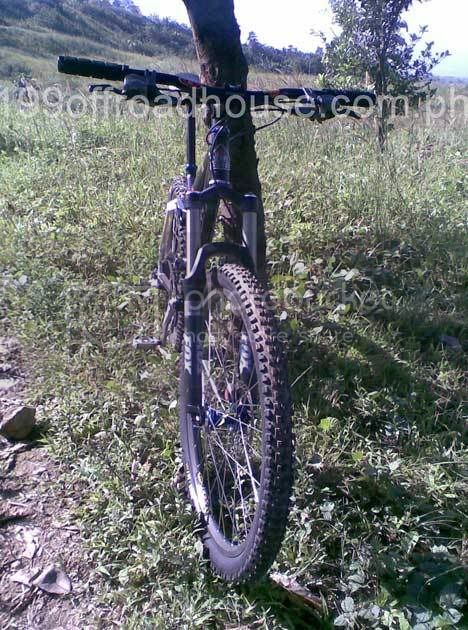 @kuyang rimpy: miss ko na tuloy mag all mountain, nagsasawa nko sa HT ko.pag tinopak, balik AM na ulit! hindi naman size 24" kaya yan pareng islaw? ahehehehe...unahan na! the race is on!!! @ julien: ayun ang diko natanong, pero check mo na din. unahan ito! hahaha....parang 4 pcs lang nakita ko e. sigurado bukas ubos yun. wag mo pakyawin ha. light dh tire na pwede din gamitin sa AM..
suggestion lng; actually gamit ko rin @ tested! minion front [2.5/2.35] - very good traction/cornering/roll fast. high roller [same] - same, can be used for muddy. wet scream [same] - very good for muddy condition. 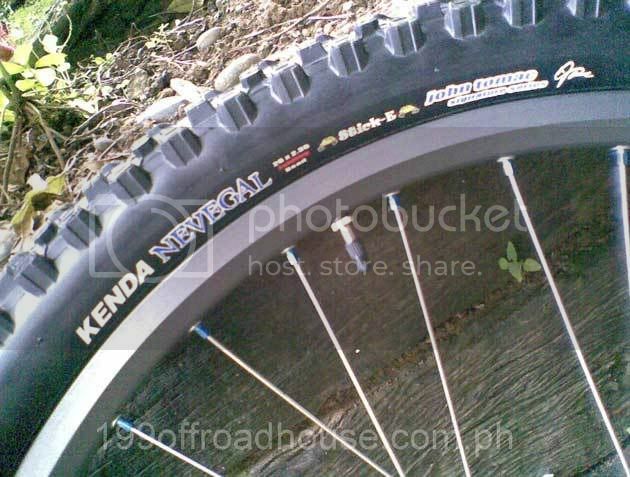 nevegal stick-e [2.1 tubeless] - makapit. mobster [2.35] - responsive but not roll fast. also good used for racing tire! @islaw: may name ba yung shop sa pag asa? and do you know kung dh or am version? thanks for tip! @evs: ok ba yung small block 8 for rear? kala ko pang xc lang. 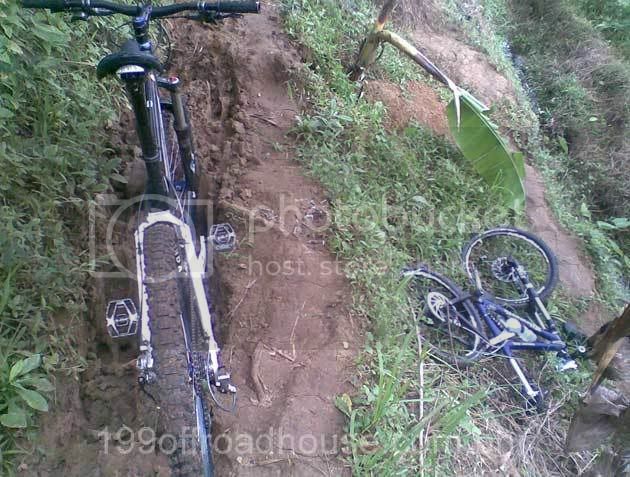 di ba nag slide out on moist loam (tagaytay) and moist clay (maarat)? of course useless in mud, but i hate mud. if so, fast rolling lightweight tire yun!